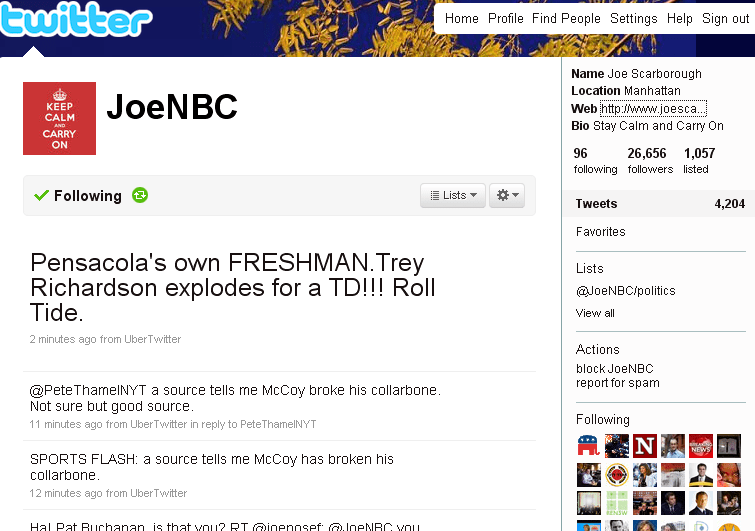 I’m in the middle of watching the Texas/Alabama National Championship Game, and when Colt McCoy got hurt, a major spike on Twitter happened. It’s actually pretty incredible how much information gets disseminated on Twitter before the networks have any information. Take ESPN for example. They only have what happened to Colt, but they don’t have anything posted about Colt’s status and it’s been almost an hour. At the same time, @JoeNBC (Joe the host of the Morning Joe on MSNBC) already posted a tweet about Colt breaking his collarbone during the Championship game. (I’m really hoping that his source is wrong, but I’m doubtful). As you can see – the power of Twitter and getting information as it’s happening is key. I know there are a lot of people who don’t get Twitter, but when you think about the political, military and social implications of being able to access and post information instantaneously, it’s pretty darn powerful. 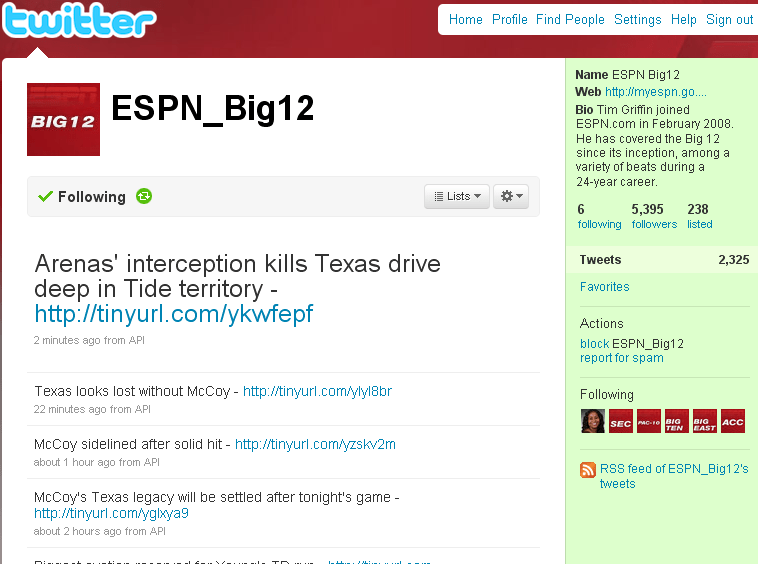 This entry was posted on Thursday, January 7th, 2010 at 10:36 pm	and is filed under texas, Twitter. You can follow any responses to this entry through the RSS 2.0 feed. You can leave a response, or trackback from your own site. i love it when you get all real-time example-y. I check the Trending Topics list on Twitter to find out what is going on and usually learn things there first–such as news of the death of Brittany Murphy. OK, so maybe that is not the best example, but you see what I mean.